rentals. The shop is open daily from 10 a.m. to 8 p.m. HOURS – Monday – Saturday, 9am – 8pm. Sunday, 10am – 8pm. The HUB offers hourly, weekly, and monthly bike rentals as well as full bike service. We sell new and used bikes, and accept trade-ins and consignments. The HUB was founded by George Bliss in 1995, with the goal of creating a community center bound by the concept of conscientious transportation. The HUB had several locations in the Village and SoHo before moving to in its West Village location at 71 Morton Street in 2006. In the spring of 2010, the HUB moved again to its current location at 139 Charles Street. 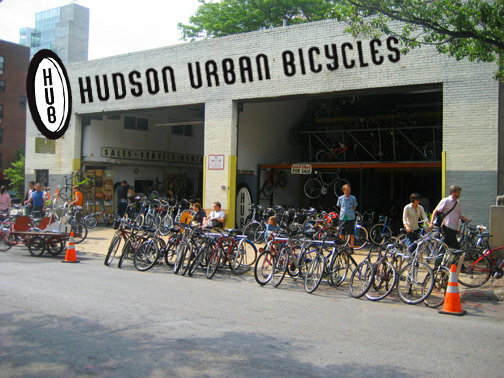 The HUB specializes in new Dutch and European bicycles, vintage American and English cycles, bicycle attire and accessories, repairs, and rentals. The shop is open daily from 10 a.m. to 8 p.m. Finally figured out how to get in touch with you? Still living in NH as a hermit. I write a blog that gets published by Rag Blog (and Downtown Express) occasionally. I hope you’re well. I am looking for contact with you, concerning a photo I would like to use for a Dutch publication called “Food for the City. A Future for the Metropolis” and is concerned on how we would feed the world in 2050, and all the necessary consequences and problematics involved. I have emailed you on the above email address and also tried to reach you on your phone number with no success. If you see this note could you please email me at dyveke@xs4all.nl ? I would like to buy an Abici Granturismo Uomo in grey for someone that lives in New York. Do you have this bike for sale at the moment or if not can you order it for me? I am about to move to San Fran and want to buy one of your custom bikes, but you it seems like your doors are close. Please let me know if and where you have relocated. Will the HUB be returning? Wanted to buy one of your bicycles I saw last year. I believe it was Italian, had he look of an old ten speed? Cannot remember the name. George is trying to find a new location as we speak. He should be moving into a new space really soon. We’ll be posting as soon as it happens! Hey, George!! I love your blog site. Way cool. The kid event is the bomb. Next time, I’ll bring my extensive lego collection! Thanks for being our Yuba Bicycles dealer and helping those New Yorkers get around with their kids on the only bike for kids that’s cool enough for NYC!